So I began reading this book to be part of my Mom's Reading Group over on Facebook. I had read a great review of it in the New York Times book reviews as well as seeing it come up occasionally on Amazon. I was able to snag it at a few bucks on Amazon's used books. For those of you who love books like I do, being used on amazon is a good way to go. So as I began the book I instantly loved it. Then again I am a huge historical fiction fan so what would not be to like about a book about the "Lost Generation". I do love this time period and am endlessly fascinated by F Scott Fitzgerald. 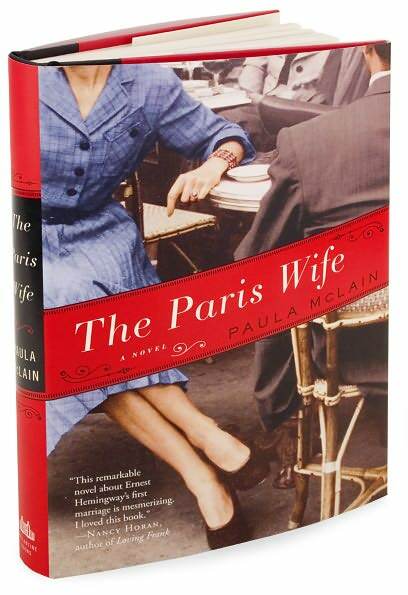 This book takes a look into the life of both Ernest Hemingway and his wife Haddy. It covers the store of how they met, the early good years of their marriage, and its ultimate end. Although this book is about Hemingways' wife I found it was equal parts always about him. After reading this book, I can assume that is how it always was when they were together-all about him. Now I loved the character development and the love story that was Ernest and Haddy. I also really liked the look into how their marriage fell apart. Most often stories of divorce are about the bitterness and finality of it, there was a lot of the book that was about them trying to figure out how to end their marriage. A negative of this book was I was expecting something more from it. It got amazing reviews-I just sort of kept waiting for a big moment, something monumental. That never happened. It doesn't mean that it takes away from the positives of the book it just means that if you are reading for this for a big shocking moment, a huge plot twist...this book doesn't have that. Having finished this book a few weeks ago I am not more ok without that big moment then I was upon completion of it. This was a solid read with great character insight and development. I would give it 3 out of 5 stars....maybe 3 1/2 only because it didn't have that moment that I kept expecting.